Nest Fragrances has always offered an amazing Holiday Collection, but this year they really outdid themselves. New this year is the Nest Holiday room spray. Room sprays are great for an instant burst of fragrance. They works well in foyers before company arrives, in your vacuum filter to fill the room with fragrance while you clean, and in powder rooms to keep them smelling fresh and festive. The bottle is so attractive it can be left out for easy use. Also new is the Nest Holiday Grand Candle which was understandably selected for Oprah's O-List this year. The enormous candle weighs about 12 pounds in the box and lasts over 350 hours. Covered with decorative gold detail and packaged in a magnetic close box, this Nest Holiday candle make a great corporate gift or anytime you want to make an unforgettable statement. We have one in our family room and it fills our whole home with my favorite holiday fragrance that lasts for at least a day after we extinguish the candle. The classic Nest Holiday candle is a must-have if you've never experienced one before. These make great hostess gifts as well. The little Nest Holiday votive candle is perfect for powder rooms or to display across your mantel or to add a sprinkling of light and fragrance to your holiday decor. My favorite size is the Nest Holiday 3-wick candle. This over-sized vessel makes a great candy jar or flower vase when the candle is done and it looks beautiful on a coffee table. It's also a great value offering about 3 times the burn time as the classic candle for less than double the cost. 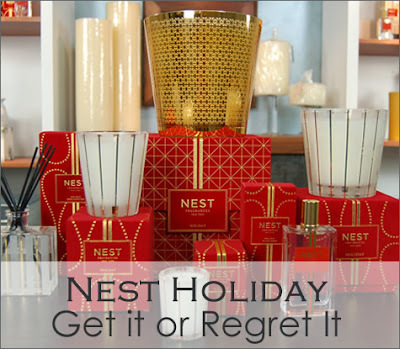 The Nest Holiday diffuser is perfect of you want to provide constant fragrance. These are perfect for foyers so that you and your guests are greeted by this cheery scent, and in powder rooms where you always want it to smell nice. Nest diffusers are very well prices, at just $38 each, and last about 4 months which is the perfect amount of time for a holiday fragrance. We fell in love with Nest Birchwood Pine at first sniff. The scent is filled with brisk air and crisp greens for a clean, invigorating holiday fragrance that definitely gives the uber popular Thymes Frasier Fir a run for it's money. The vessel for the Nest Birchwood Pine candle and votive candle were updated to match the decorative gold design on the packaging. New this year is the Birchwood Pine diffuser and room spray. Both are perfect to give your real or artificial tree a boost of that fresh pine/fir scent. Nest also added 2 new products to the Sir Elton John Holiday Collection. We love the new Sir Elton John Fireside candle with a combination of Madagascar Vanilla, exotic woods, smoky embers and juniper berry. This fragrance captures the warm, familiar aroma of smoldering, fireside embers. The new Sir Elton John Holiday 3-wick candle is stunning and perfect if you want even more of this amazing holiday scent. I love the over-sized aubergine vessel and wax. Elton John donates a percentage of his sales to the Elton John Aids Foundation. What's your favorite Nest Holiday product? Love Nest Holiday and Birchwood and Pine! Why can't I see the video?